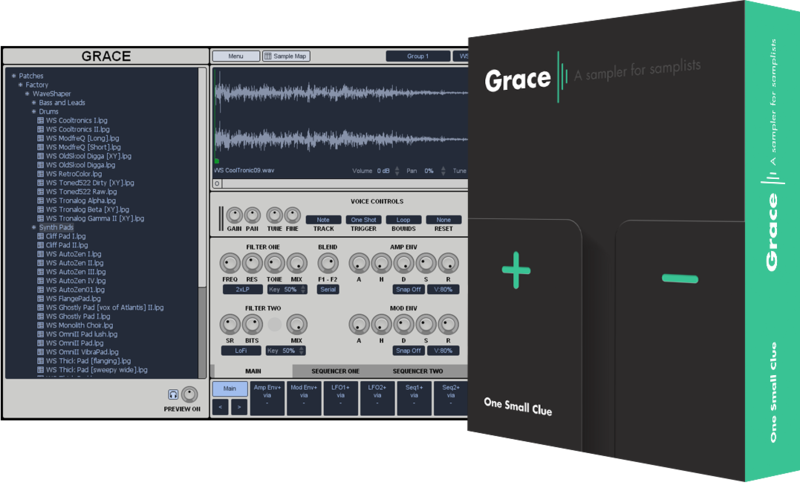 Originally a paid-for plugin, One Small Clue's Grace software sampler was already a worthwhile addition to your arsenal. Then after being made completely free, its worth exploded, and to this day remains one of the best free samplers available. If you've ever used a sampler before, booting up Grace will seem very familiar indeed. It's made up of four different sections, housing the patch browser, sample editor, voice controls and the modulation slots, with a sample mapping function tucked away in a separate tab. Features include 2 filters per voice (LP, BP, HP, comb, lofi & ring modulation), 2 x AHDSR envelopes, 2 x LFOa, 2 x step sequencer and 4 x XY control pads. Even though you'll be eager to start building up your own patches, Grace comes with over 400 individual samples created by WaveShaper, which are well worth trying out. Being optimised for workflow from its inception means that almost any function in Grace can be completed in no more than two clicks, meaning building a new preset from the ground up is achieved in minutes rather than hours. Grace is available to download for Windows using the link below.